writing a piece about peace. I take note that – for now – my house is extraordinarily peaceful. The children have long since drifted off. Marshall retreated to bed moments ago. And after sitting stagnant for quite sometime, I have finally hit my stride. I’m finally on a roll! A passage spurs a thought. My little miss who decided that two naps was one too many and was therefore miserable for half the day. A whimper quickly rumbles into a cry and then and out-right scream. Just let me finish writing this! I curse him under my breathe. He can hear her. I know he can! I try to press on, but those perfect little thoughts begin to evaporate right in front of my eyes. I grasp at what is still there and jot down broken pieces of thoughts, hoping that I will be able to salvage them. I finally give in and stomp to her room. I hope to goodness he hears me and my overly dramatic sighs. And, yes, I know how silly it all is. I am aware of the aburdity in my mind. And most times I would just laugh it off. Tonight I am ugh. Just ugh. Because I know she wont be a baby for long. And one day I’ll miss this. I am juggling too many things. I am out of sorts and not quite myself. I am am give slap out. I try to fake it til I make it, but it’s not working. I am frustrated with her. I am frustrated with him. But mostly, I am frustrated with me. Why? WHY? Why can’t I let it go? Why can’t I sit in this moment and just surround myself with the good? With the warmth of the babe in my arms and get lost in the big, dark eyes looking up at me? But something’s in the way. And I close my eyes and listen to the short and shallow sound of her breath, in and out. in and out. in and out. And I drink in each gulp.gulp.gulp. and she drains her bottle. Without a word, I hold her and I rock her. And I match my breath with hers. I kiss her perfectly puckered lips. I realize that without ever feeling the weight of the world on our shoulders, we could never understand freedom. Without moments of chaos, exhaustion, and frustration, we could never appreciate peace. Without bad moments, we would never be able to really comprehend the good. And there, ladies and gentlemen, is my piece, my article, my post. You know the one I was working on so fervently and then got side-tracked? Yeah…this is better than what I was going to say anyway. 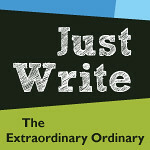 I’m linking up once again at The Extraordinary-Ordinary for Just Write. Oh how many times I have let them scream until He gets up. I am dramatic with having to get Bella even though I am the one awake and he is sleeping. It is amazing how even in the time when we need peace and time alone, how something so tiny can bring it to us. Zen moments and clarity in a rocking chair and a bottle. I have to believe that every single writing mama can relate to your conflict here; been there, done that, do NOT want the tee shirt!! Well penned, well captured. And I think this was your way to linger just a little longer. Beautifully said. We all struggle with this. I wish there was an easier way but sometimes there isn’t. so beautiful. There always is a constant struggle within ourselves, as mothers. Sometimes I wish I was a man, they don’t seem to have these same thoughts and stuff just seems to roll of their back, but then I realize that I don’t and it will all be okay. I was sighing with you. How I know those kinds of evenings well! Beautifully written! I know this story so well. And I am also dramatic about it. But you are right – the chaos helps us appreciate the peace.